GLP2-tester series are the result of our experience in manufacturing following “customer based technology“ for more than 20 years. With precise, intelligent test processes the testers set the standard regarding operating ease, modularity, functionality, measurement accuracy and performance.AC tests up to 100 kV. DC tests up to 98 kV. Suitable for production testing of luminaries, white goods, coils etc. The high-voltage test AC (alternating voltage) serves for testing the electric insulation and voltage proof of clearance and leakage paths at electric components, modules, machines, devices and systems according to various national and international regulations. The PE test is performed with devices of protection class I. 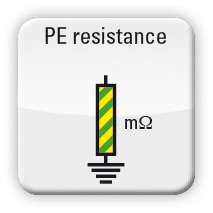 The PE resistance is checked to see if it is below a limit value defined in the standards. The test detects whether possible leakage currents inside the test object are grounded correctly. The insulation resistance test can be performed at devices of protection class I as well as protection class II. 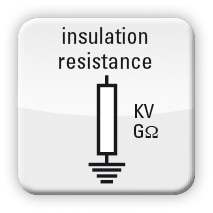 It checks, whether the ohmic insulation resistance exceeds the limit value stipulated in the standards. The test is to detect if too high leakage currents could occur in the test object. The residual-voltage test serves for detecting the residual voltage at various touchable connections of the test object according to standards. 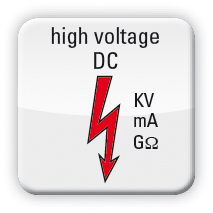 According to the standards the level of the residual voltage is measured after a certain time. 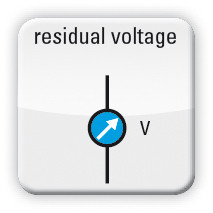 Residual voltages occur, for example, inside the test object through charging. 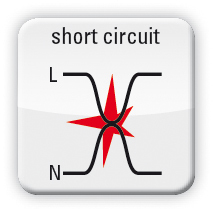 In principle the short circuit test is an ohmic resistance measurement. This test is usually performed automatically before an electric functional test in order to find out if there is a short circuit between the conductors. This test prevents voltage being switched to a test object which already has a major short circuit. Thus damage of the test object can be avoided. This test can be performed at 1- as well as at 3-phase test objects. In general, the functioning test serves for detecting the charging current of a test object. Considering a certain tolerance, this charging current is compared and automatically evaluated with a set value. Depending on the application it is also possible to measure and evaluate the power, the phasing, and other electrical parameters. The arc detection test is characterized by detecting micro-discharges in a partial part of the insulation at an early stage. The micro-discharges in one part of the insulation system will, in due course, lead to increasing damage at this point. After hours, days, weeks, months or years the insulation system is weakened due to persistent micro-discharges and a complete failure occurs. The arc detection serves for testing the insulation quality. The test is always performed in connection with a high-voltage AC test. At electric machines the polarisation index is a very important measured variable to determine the quality and deterioration of the insulation, which occurs with increasing age of an electric motor. 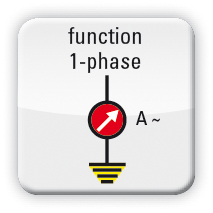 The inductive resistance can be measured and evaluated by means of various methods.The ohmic resistance is measured and evaluated.For an automatic evaluation, the set value of the resistance is defined and the allowed +- tolerance is given.